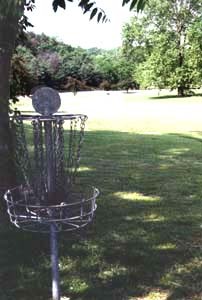 Hole # 6 is the longest hole on the course. A gradual uphill slope will fool you and drop your shots short. You are also usually facing the prevailing wind here. The 4th fairway lines the left and the road (US 221 - Brambleton Ave.) runs down the right side. 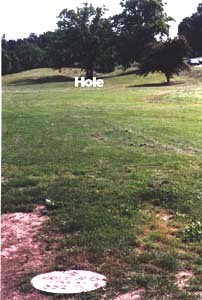 The fairway is basically wide open, but the Pole Hole is placed between two tree trunks that run in line with the fairway, so you need a good curve second to get at the hole.